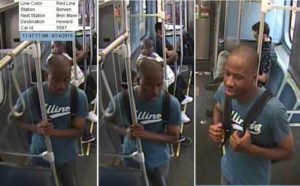 Area North Detectives are seeking your assistance in identifying this wanted offender in the aggravated battery of an elderly transit passenger. On June 14, 2018 at approximately noon, a female senior citizen was riding the Northbound CTA Red Line train. She was reading from her Kindle when the pictured offender approached and, completely unprovoked, viciously punched her in the face, causing serious injury to her eye. The offender exited then train at Jarvis Avenue. The offender is described as a male black, 20’s, 5’7-5’9, 160-180lbs, short black hair, wearing a short sleeve blue “Illinois” tee shirt, jeans, brown shoes with a white upper heal, and a black backpack. This alert gives notice to businesses and residents of the South Chicago (4th) District. There have been two recent Armed Robbery incidents of fast food restaurants on beats432 & 433. CPD COMMUNITY ALERT – Armed Robberies (P17-N-261) 19th Dist. This alert gives notice to two Armed Robberies committed with a handgun that have occurred recently within the 019th District. Area Central Detectives are seeking the public’s assistance locating the vehicle depicted above and identifying the owner of the vehicle [see attached video]. The vehicle appears to resemble a newer model, black Ford F250 or F350 pickup truck with black wheels (possibly a diesel engine). The wanted vehicle also has a large black tool box with a silver handle inside the bed of truck. The offender’s vehicle purposely ran into the rear of the victim’s vehicle at 5500 South Kedzie forcing the victim Southbound on Kedzie. The victim lost control of his vehicle at 57th Street, crashing into a tree. The victim was killed in the crash and the offender was last seen Southbound on Kedzie at 63rd Street. If you, or anyone you know, have any information regarding this wanted vehicle and the identity of the driver and / or owner of the vehicle, please contact the Bureau of Detectives – Area Central at (312) 747-8380.